I’ve Become a Costco Member. Please Share Your Costco Advice! | Keep It Up, David! I’ve resisted Costco for years and years, mostly because I’m single, and live alone in a condo that doesn’t have many kitchen cupboards or much storage space. I simply don’t have the real estate to stack up dozens of rolls of paper towels, or store 5-pound bags of anything. That doesn’t mean I haven’t enjoyed Costco on very rare occasions. I blogged about a trip to Costco with my friend Tiffany about five years ago, and since then, I’ve gone with my friend Jennifer twice, with my mom to her local Costco in Michigan, and with my mom and sister-in-law on my recent trip to the bay area. I bit the bullet and joined Costco for one very specific reason: to buy a car. They have an awesome car program where, as a member, you get access to exclusive prices that are lower than what you could likely negotiate on your own, and it’s a set, done deal, with no haggling or stress. My aunt and uncle told me about it, and it made my car-buying process easy-peasy. 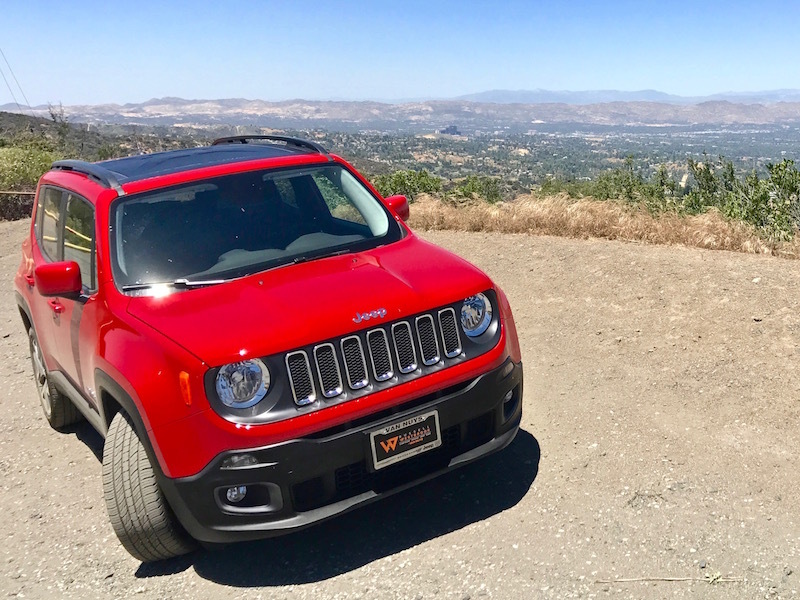 And now I have a new Jeep Renegade that I absolutely love! But now that I have a Costco membership for the next year, I might as well take advantage of it. So far I’ve filled my gas tank twice at Costco, and paid approximately a quarter less per gallon than neighboring gas stations. And, the other day, I ventured into the warehouse for the first time. 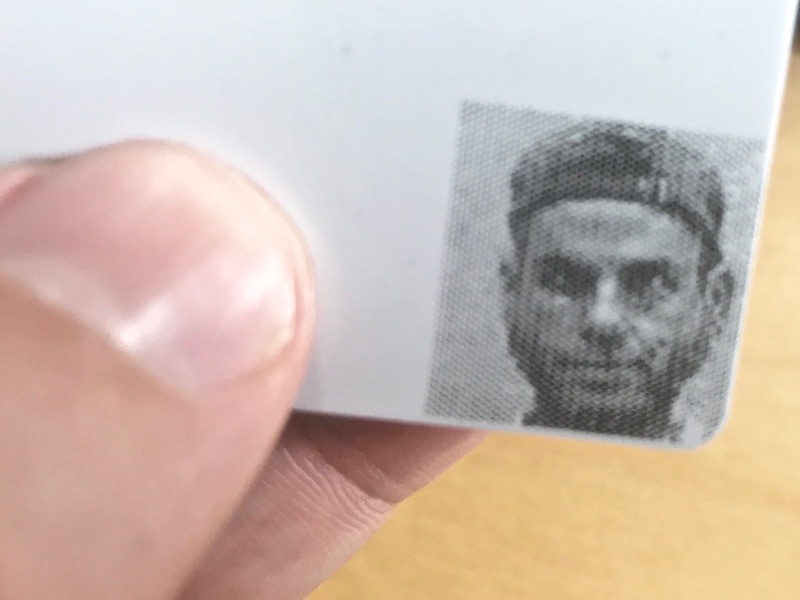 First item of business was to pick out another big-ticket item: a new printer. Well, that’s not nearly as big a purchase as a car, but then again, what is? I’ve been in desperate need for a printer for about a year, and I found one at a great price, and it works beautifully. From there, on to the grocery section! They have a lot of fresh produce, but a lot of it is in quantities that I probably couldn’t consume by myself. 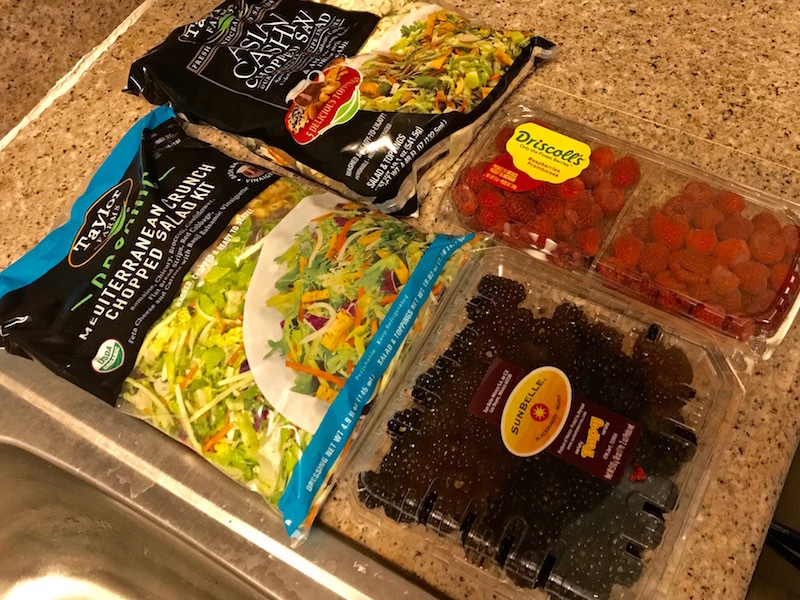 I can polish off berries like nobody’s business, so I picked up some raspberries and blackberries, and some big salad kits, too. 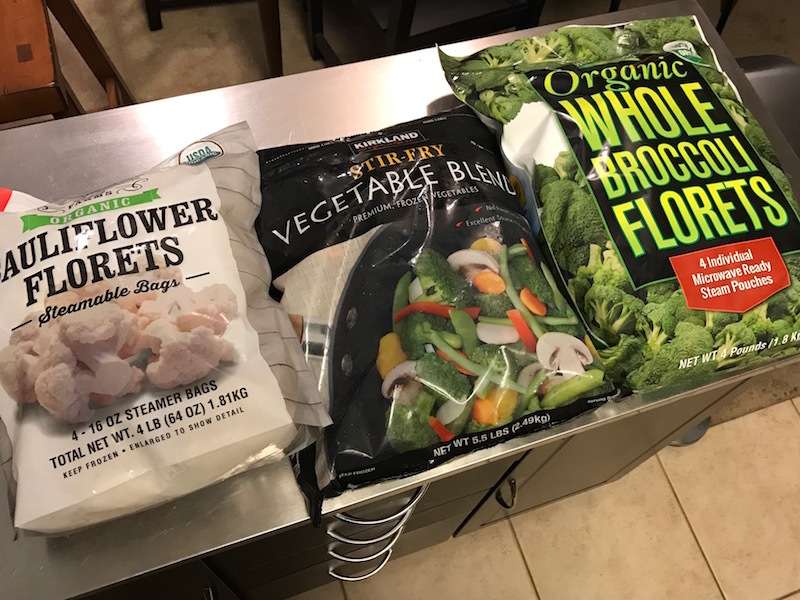 I bought more veggies from the frozen aisle: cauliflower, broccoli, and a stir-fry medley. They changed the cauliflower and broccoli since the last time I had been there. Now the big bags have 4 smaller bags within it – great for doling out portions! 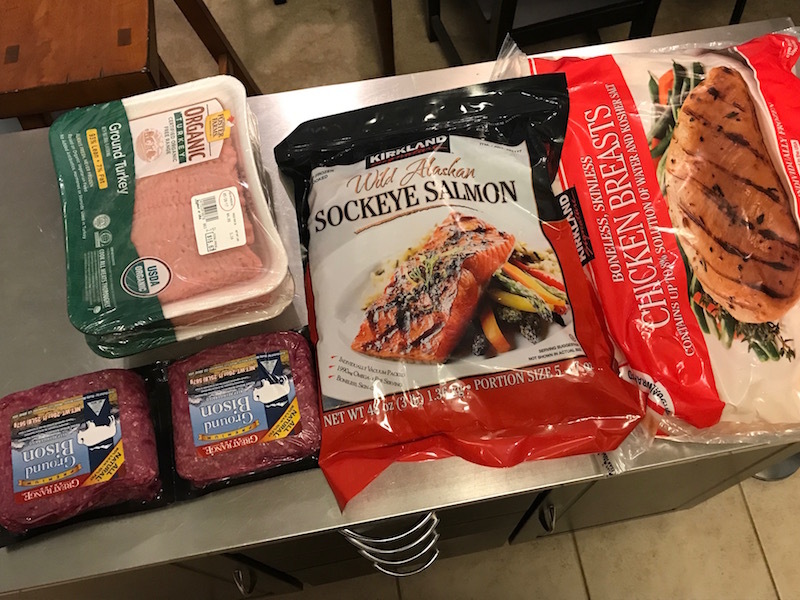 I also love the individually-wrapped chicken breasts and salmon fillets in the frozen section, so I picked up some of those, along with ground turkey and ground bison from the refrigerated cases, although I ended up freezing them, too. I go through lots of eggs, so buying eggs at Costco was a no-brainer. I bought 24, and then promptly broke three of them when the case fell out of my car as I was loading all this stuff into my trunk. Whoops. 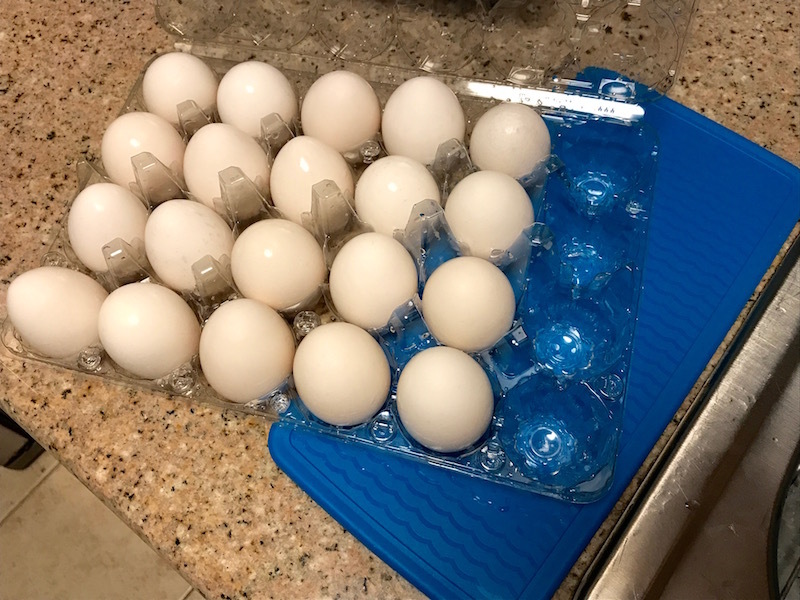 Then, at home, I removed the remaining eggs to rinse the spilled yolks and whites out of the case, and I broke a fourth egg. Whoops again. So I’m down to 20, but even accounting for my clumsiness, it’s still a great deal. 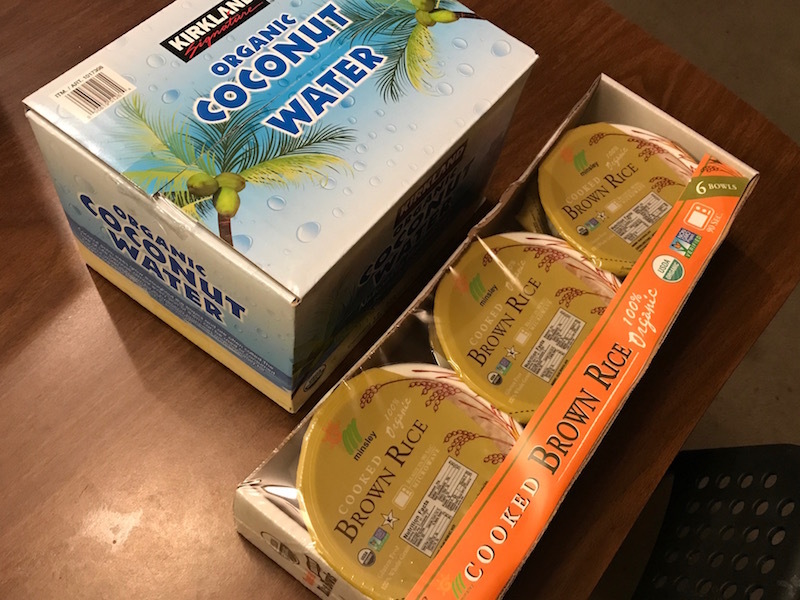 There wasn’t much in the grocery section that I wanted to buy, mainly because of the quantities and lack of storage space, but I did pick up coconut water and some pre-portioned and pre-cooked bowls of brown rice, which I’ve tried before and really like. And that’s it, folks – the contents of my first Costco haul! I’m set for weeks, possibly months. There were whole entire sections of the store that I skipped, and aisles I didn’t go down, so let me ask all of you: What do you like to buy at Costco? What should I keep my eye out for? Share in the comments section! Lastly – I’m proud that I stuck to the healthy stuff. That 62-pound bag of Cheetos was really calling my name! This entry was posted on Thursday, May 11th, 2017 at 9:58 am and is filed under Uncategorized. You can follow any responses to this entry through the RSS 2.0 feed. You can leave a response, or trackback from your own site. 18 Responses to I’ve Become a Costco Member. Please Share Your Costco Advice! Lots of awesome ideas here, thanks Amy! I’ll look for the sausages – I love sausage! Also, I love the new car!!! We were looking to buy a Renegade before we decided to move. Also, in response to your inquiry below about best time to go- I always like to go as soon as they open. It’s way less crowded first thing in the morning. Happy Costco-ing. First thing in the morning – makes sense! Thanks! And you missed out on the Renegade but I don’t think you mind living where you are, so it all worked out! I don’t have a Costco in my area, but just returned from visiting my daughter in St. Louis and was fortunate to go to hers. I just love the store!! She always gets her gas there as it is much cheaper. I can’t really give advice on what you should look for there David, but it’s a great place with so much to offer the consumer. My advice is that on a day when you have time, just wander the store and I’m sure you will see why I love it so much. Enjoy! I was joking with friends that I need to find a time when the store isn’t a madhouse, because that would make browsing so much more fun, when you’re not constantly dodging shopping cards and crazy crowds. We asked our cashier the best times to come, and he didn’t really answer. Meaning… it’s always a madhouse! Congrats on the new car! Beautiful. Smart move to go through Costco. I tell everyone about the program. I just bought a new Honda Pilot in February–my 4th car thru the Costco! What do I buy? Individual organic salads, organic ground beef, frozen fruit and avocados (6 in a bag! I mash & freeze in ice cube trays. Thaw one cube for my scrambled eggs with salsa.) I also buy the 2-pk whole organic chicken to roast, de-bone and freeze. Thanks for the tips. You can freeze avocado? I had no idea! I love getting gift cards at Costco since they are less than cost! So I can get a $100 gift card for $75. I also get toothpaste and random stuff there. And for paper goods and other things that are in huge bulk portions, I go with a friend who doesn’t have a Costco membership and she pays me for half and we split the items. That way we both have the space to store what we buy. I live in a 500 square foot house. I can’t store 200 rolls of paper towels. Ooh – splitting purchases is a great idea. And I didn’t know they sold gift cards – thanks for the great tips! Nice wheels, dude! Congrats. I like the unsalted nut mix, the HUGE bags of spinach, the unrefrigerated almond milk, the frozen berries, and the chia seeds, to name a few. Although, going to Costco is a HUGE challenge in controlling my urge to buy both a slice of pizza and a huge cup of frozen yogurt on my way out the door. Thankfully, my irritability by the end of my shopping trips has always prevented me from giving in to this urge. Yay for being a cranky old man! Thanks dude! And yea I hear ya about the irritability. I’ve only been a couple times and my patience wears thin by the time I’m in line at the checkout. YES! I’d break a sweat before I even got out of the electronics department! Additionally, pushing a heavy cart loaded down with all the stuff you’ll buy could count as a workout. Except for Cheetos are light and I usually stock up with 10-12 family size bags.